“I love making my own music. I also love the games even though some of them are hard.” Chloe is now up to learning how to play with both hands and I am very impressed that she is already up to that in only a matter of a few short weeks. After more than 15 years homeschooling a miracle has happened. Yep, that’s how I’m classifying it. A real miracle, and I am being very serious. Maybe not the divine type, but a miracle non the less. My children started music lessons that actually teach for real. I tried Piano Suite (and I have trouble playing a digital radio) and it’s really easy! There are some gaps in her music education that she needs to review and she loves, loves, loves the collection of music that she can search through and practice songs all over the musical map – from classical to current and popular rock n roll! Chances are your child won’t even realize they are practicing because the entire program feels more like a fun reward. The program is well thought out and extremely comprehensive. I liked how it not only taught notes and finger positioning but also integrated history of composers into it in a fun way that presented the information so my children wanted to learn more, and I liked how the programs were interactive… My girls like it because it’s fun! It is so much more than teaching your child how to play the keyboard. They are taught by (and in the process learn about) famous composers. They have an opportunity to learn about and listen to famous classical music. I love the interactive feature of the lessons. Children are given immediate feedback as they complete the task they are asked to do. I love that they get to compose their own songs in the lessons and hear them played back to them. I am amazed at all of the wonderful interactive features of this program. It is very helpful to have the practice lessons connected to the Theory Thinker so you go right from hearing what to do to doing it yourself. I LOVE that you can customize the Piano Player to whatever you need! Bigger notes, tempo, lyrics, starting hand position, and my favorite of course, Wait for note. You can even mark off certain bars and only play those. I love the immediate feedback that tells you how many notes you missed and where. I like to go back and keep playing until I make 100%. Children’s Musical Journey Volume 1 is for children ages 4-8, but I feel like it would be appropriate for older beginners as well. I highly recommend this program to anyone wanting to bring music into their home. I can’t believe how thorough it is, and how much the kids love using it. I have penciled this program into our educational plan for the foreseeable future. This is the best homeschool music program I have ever seen. I love how the program adapts to Bug as well. As he plays, he gets immediate feedback. If he is asked to play a note, and misses it, the “teachers” on the program tell him to try again and give him more practice. This immediate feedback ensures that he is really learning and “getting it” before moving on. Adventus also has manuals available with absolutely wonderful daily and weekly lesson plans all laid out! Even if you are not musical, you will find it very easy to give your children a very well rounded musical education by just following the instructions. I struggle even as I type because I know the words I write in this blog post will not adequately explain just how much your children and even you can learn from this program. Every member of your family can begin to learn to read music, music theory, rhythm, music history, and yes of course piano skills with this program. Even the adults. The software is so detailed that it trains you to play with such precision that no human instructor could ever manage. I think that combining piano with a computer like this is going to be the best way for kids of the technological age to learn to play and appreciate music. The program also introduced my son to famous composers right within the program. This brought them to life and we actually had to work the lesson into a larger part of our schedule to accommodate the extra time he spent researching more on whatever composer he was learning about. To me, that really speaks to all the effort that went into this program to make it as inviting and yet challenging as possible for any age. I really love this software! I have been amazed at the progress Bentley has made, and how easily and happily he has taken to it. I love it when the use of technology can add something new and valuable to an existing arena of instruction and I think this program is a great example of this. Seeing the notes you’re playing on the screen in front of you, with instant feedback, is awesome. The visual cues that help you learn rhythm and timing are great! I imagined that my girls would beg to take their piano lessons more than once a day and would want to stay on for quite some time. I was not disappointed. It takes the beautiful history of music and weaves in piano theory in a fun and captivating way! Children enjoy learning about musical giants as well as from musical giants. The folks at Adventus have done an incredible job of combining piano instruction with music theory, ear training, and music history all rolled into one. I have never seen a product like this before. I can not begin to tell you how impressed I am with this product. My formal education actually includes a Bachelor of Arts degree in Music Therapy. In having taken piano, music theory, ear training, and music history in college, I can truly say that if your family were to fully utilize the features in this program, your children and you would have a solid foundation in music. Now on to the specifics. Our family absolutely endorses MusicIQ Homeschool from Adventus. The software is incredible. The breadth of musical knowledge it shares goes way beyond just piano lessons. The pricing is exceptional.The customer service was superb! So let’s hear for MusicIQ Homeschool, Maestro! I decided to try the Piano Suite lessons myself. I started using the theory lessons way back with sharps and flats and progressed from there. I was really impressed with how the program functioned to “listen” to the what I played and let me know when I had made mistakes. It really forces the student to pay attention to accuracy and become motivated toward an error-free performance. One of the best things that they like is when they are asked to create their own music. It brings out their creativity and allows them to practice all they have learned. If you are not musically inclined, this is a good music software for you since it needs minimal intervention from the parents and allows your kids to stay focused on learning music while having fun! It is an excellent program for someone with no prior experience with music/piano. He really enjoys it and would spend hours doing the practice and games if I let him! He begs me everyday to do his piano lesson. I have not had one negative comment about practicing and his enthusiasm has not diminished. Consistent instant feedback. This feedback is always positive and moves your student forward even when they make a mistake. 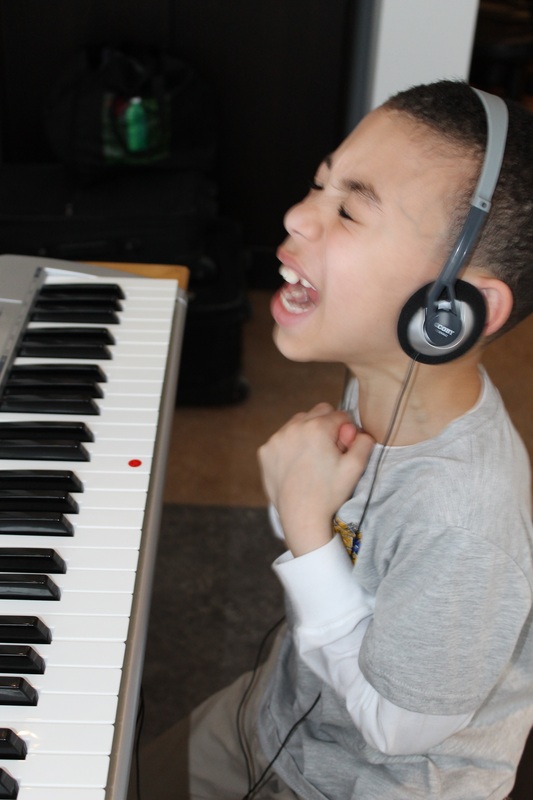 Seeing my son, who is VERY particular about his music (he likes jazz) and dislikes mom playing the keyboard or singing (and is vocal in that dislike), actually coming down to play on the keyboard himself, and making up little songs on his own…. ah…it just tickles my heart. This has been one of our favorite curriculum’s. Who knew learning/teaching your child to play the piano could be so fun for both you and him! I highly recommend this curriculum to parents with or without any musical background. Noah has had an amazing time learning to play the piano and I can’t wait to introduce this to my other children as well! My children have had no prior music instruction but they are lining up for their piano lessons. Having taken years of lessons as a child myself, I know this is NOT normal! It’s been so much fun to watch them learn, to enjoy their time, and beg for more. I can’t wait to see how far this takes them! “Can I do another lesson? Play another game?” Is the oft-heard question when they are finished. They argue about who gets to play first. I like that any gaps in music learning are filled in. I have been teaching myself how to play the piano now for several years with lots of starts and stops. Needless to say there are gaps. I’ve started playing in the Piano Suite program and I can already identify places that I can improve. We have been so blessed to get to review MusIQ HomeSchool from Adventus. It is a wonderful piano program and we’ve had amazing results! The program claims that it can help children compose their own music. Alyssa did gain the ability to read, understand, and COMPOSE her own music after participating in the lesson and practice sessions. This aspect of the program is what astonishes me the most! I loved that the program was taught by different animated music composers! This aspect changes things up and provides variety which helps maintain a young child’s attention. My daughter remained enthusiastic and focused during her lessons. Music appreciation is being taught even though Abbey doesn’t realize it. These games are a wonderful reinforcement and another clever way to sneak in some extra practice. I started Josiah with the Children’s Music Journey 1. He is 11 and older than the suggested ages (4-10), but considering he has had no formal music training, I decided that he would do better with starting from scratch. He is dyslexic and I didn’t want to overwhelm him. It turned out to be a good move. He really loved it. I loved the enthusiasm this program generated in her! And being a worksheet-kind-of-girl, she enjoyed doing those, too. I had a sense that this program was all-encompassing, covering so many aspects of music instruction in one convenient package. I could definitely see us continuing to use such a wonderful product. It has already brought her so many hours of happiness while learning at the same time! I was astounded at the sheer number of pieces available for me to practice playing! I’m totally addicted! I never had formal music instruction, but my family owned an organ when I was growing up, and I taught myself to play. So I’m greatly looking forward to using Piano Suite to hone my skills and correct my bad habits so I can learn to play properly! She is only 3 1/2 and is firmly understanding the information. I sit and do the lesson with her, but I don’t have to help very much. I loved the other day when she said “I’m playing the piano like Mr. Beethoven.” So sweet! The lessons are very age appropriate and present music in a unique way. He didn’t start off with note names or treble clefs. Instead, the program focuses on what a child can understand-high birds and low whales! The notes above middle C are high bird notes (you can see the seagull in the photo). The low notes are low whale notes (see the whale??). When middle C gets introduced, he comes through as a man in a motor boat! Genius I tell you!! so much more than teaching to play the piano. It also includes music theory, history and composition. Can I just say WOW! Being able to have this quality of instruction in the comfort of our own home and for less money per month than I would spend in gas to get my kids to one lesson is awesome. We live 30-40 minutes away from town so this is perfect for us. Also the lessons, practice, games, and activities are spot on for their age. MusIQ Homeschool was exactly what we were looking to use. I love it because all 3 of my kids can take piano lessons without me having to run all over town. What I really like is the detailed lessons, and the suggested activities were relevant and encouraged a love of practicing, which all of the kids wanted to do everyday. Most days they all used this program for at least thirty minutes. I quickly had to create a practice schedule so they wouldn’t rip each other’s eyeballs out to get a chance to practice ( just kidding). Seriously, if you do have more than one child I highly recommend you first implement a practice schedule to prevent any chaos, because your kids are going to love this! As he progressed and finally made it to level 2 he was so excited about entering the recording studio where he was able to perform a new song . Once DJ made it to Level 2 he has been independently working through the lessons and he is hooked! The lessons plans provided for you, the homeschool mom, are thorough, straight forward and very well laid out, including the teaching plan, guidelines for practice, activity sheets, composer information, flash cards, vocabulary and more! The decision has been made that Adventus is a permanent part of our homeschool schedule, all the way through to the end of their multi-level curriculum, which includes Piano Suite, two levels of Ear Training Coach and the MusIQ Challenger Game. At some point, after completing all of this, she may be ready to move on to private lessons with a music instructor…for now, I will simply enjoy the fact that this is much less expensive than that avenue would be, and with interests as varied as her, it is one less thing we have to leave the house for….that’s a win in my book! My kids fight over who is going to start every time we do this curriculum. They both want to go “first”! I have always wanted a crack at playing the piano, so I decided to give it a try! I was very happy with how easy it was to use, and that I truly enjoyed it. I can see why my kids are having so much fun with it. All I could think was, “Where was this software a year ago when she decided she wanted to play the violin? I would’ve saved so much money on lessons…lol” But truly she loves this program. I do not have any arguments when I tell her that it is time for a lesson. She actually begs me to do a lesson. The really nice thing about this program is that even though both Lydia and Joey are learning to play other instruments (Lydia is taking violin and Joey is taking guitar.) Children’s Music Journey will only enhance and help the child to learn how to play that instrument that much better. WE LOVE THIS PROGRAM! I love that my kids ASK to do piano! All three of my school-age kids, ages 4, 8, and 10 love this music program. More than anything else we have tried, more than me sitting by their side attempting to make music make sense. Our kids really like music, but I was concerned how well the history and theory would be received, but because it ties in so well with the program they really enjoyed all of it! It’s not like what I pictured: “Mom, we have to practice AGAIN? !” Instead, they ask when they get to do their practice! They absolutely love the practice games and their time in the improvisation room. I like that they actually enjoy the lessons and practice as well! The lessons are far from the same style I was taught, but I believe this way may actually be far more effective. It has amazed me with how well this program has taught him so far. The way the characters explain the lesson is very clear, precise, and easy to understand making it very simple to retain. Each lesson is probably about 10-15 minutes, which is just right for Tommy’s attention span. We have just loved using this software! In fact because all the children love it so much, it’s hard to fit all the lessons in each day. I’ve really enjoyed using Piano Suite Premier, that is when I can get the keyboard and computer away from the kids. I’ve found the program easy to use and I love how you can customize just about everything in the program. I know my kid’s will love this after they have worked their way through the lower levels. I have to chuckle as the third lesson the teacher sings short short short long. My daughter picked that up so fast and started singing that for days. I think back in the day when I learned piano I remember singing it myself. I notice that the more we use the program the longer my kids wants to practice and play around. My boys finished the first five lessons, and are excited that when they go on for more today, they move on to a new teacher! As I sit here writing this review, “The Puzzler has been in here no less than five times asking if I will go set the keyboard and laptop, up so he can do his next lesson “NOW, please?”, LOL! Now, THAT’S the sort of response I love to get when it comes to educational products, because it means they are learning with fun, not with drudgery. As my husband likes to call it, it’s “stealth” education! What a blessing MusIQ has turned out to be! Here’s my little confession…I have been using the program to learn piano too. I started at lesson 1 just like they did. I have been learning right along with them. I really enjoy music, I always have, and I hope to be more musical as I get older. Just for the JOY of it! I love how this program incorporates many aspects of music, not just actual teaching. I hadn’t heard about it but soon fell in love as you’ll see why. It’s a perfect, affordable fit for a large family. I love how comprehensive the programs is, how it engages the younger ones, and how the older ones seem to be learning quite a bit. My absolute favorite aspect is how the keyboard hooks up to the computer and allows instant feedback on their playing ability. This. Is. Awesome! Seriously. It’s one thing to think you are doing something right, and it’s another to have the computer catch mistakes or show success. I also really like how you can slow down the tempo, learn the notes, and then get back to the correct speed. This keeps the student from getting frustrated on faster pieces. We haven’t added our own songs from the web yet, but I’m sure we will at some point. One thing I have come to realize and appreciate about Ben is that he has quite an ear for music. I always knew he loved it and could sing and dance well from a very young age, but I had no idea that he truly has a musical bent. I’m not sure he knew that either, so we are both grateful to MusIQ Homeschool for helping us discover this so early in his journey. The student will have a very solid foundation of ear training, rhythm training, and notes on the Grand Staff. This is very comprehensive! I still have the image in my head of my sweet girl in her nightgown, in the midst of a lesson. She was standing up and had herself staged like a rock star at the keyboard while composing her own song. The delight on her face was obvious. She was having a blast! She can’t wait to share what she’s learned with her dad at the end of the day, and the fact that she’s kind of re-teaching it as she explains her lessons are showing us that she’s retaining the information. My kids were glued to the screen! There is no way that I could teach them anywhere close to what they are learning with Adventus Children’s Music Journey Volume 1! I can’t wait to see how much more they learn as they progress. Personally, I was very much impressed by Adventus. I am no longer looking for a piano teacher. I feel that the piano teacher we had was top notch, she had a master’s degree and 30+ years of experience teaching, combined with an incredible love for kids, and I felt this program taught the kids on that same level. With the added benefits of: a lower price-tag; the convenience of all the lessons being in the dining room so I didn’t have to sit and entertain kids in a waiting room for two hours a week; and, the best part, their “teacher” was present for not only every lesson, but for every practice session. I really liked that the program is very kid friendly. It doesn’t move to fast. There is lots of practice time plus fun games to play that make it so they don’t even realize they are practicing. I’ve heard from a lot of friends about having to fight with their kids to get them to practice so I have to admit I wasn’t really anticipating the fighting over who got to practice first! The kids really love the program and ask to use it again and again. I, too, am amazed with the ease of use and quality of this product and I personally found it fun to use myself for piano lessons at home. My children have been amazed by the Adventus Children’s Music Journey program. They beg to use this product and have learned so much from it. I love that each lesson starts and ends with a classical piece of music. I love that they aren’t just learning how to read music and play the piano, but they’re also learning music theory and composition, as well as gaining exposure to great music they may not otherwise have heard so regularly. MusicIQ Homeschool is perfect for use by anyone, even if you don’t have any musical background. I love the immediate immersion for students into classical music and composers. This animated, interactive software is delightfully well-made. It includes over 95 lessons taught by famous animated composers. With the inclusion of music history, theory, rhythm and improvisation, you have all your bases covered. As a former piano teacher, I have been very impressed with the intuitive nature of the software. I like the positive reinforcement the program gives the kids when they play a piece correctly. I think the way in which you are corrected when making a mistake is very helpful. Oh my gosh, I LOVED this program and so did my 7 year old daughter. The lessons gave her an opportunity to learn, practice, and apply what she had learned. She really enjoyed that the lessons where interactive and she had an opportunity to compose her own music. I loved that she was introduced to the lives and music of famous composers. We LOVED this program and we would recommend it. I loved that with this software the children are able to take the lessons in the house with some great teachers. This software is interesting, colorful, and engaging. The best thing about this program is that you, the parent, are able to be involved with their lessons. I loved that the children are able to actually have a mini concert and will learn to play three different songs on the piano. And I have to say this was a big hit for them. They really looked forward to their music time and enjoyed the lessons. She liked the composer lessons and enjoyed learning more about them. I liked the systematic way that this program progressed, and even learned some new things myself. This program is very well-made. The animation is friendly for children without being hokey. The pacing is perfect for the corresponding age range, and I really like how the lessons are fun instead of pretentious. I like how the cartoon instruction is encouraging and pressure-free. I love that the colors are bright and it grabs the child’s attention straight away. History about composers and music is taught is a very natural relaxed way. In fact Little J did not realize he was learning history and playing the piano. Boo has been enjoying playing the music. I have been doing the theory lessons. It is definitely more mature and is not childish at all (some older children may still enjoy the younger program). I have also been able to play some of the music choices even though my piano skills are very limited. The reason for this is that you can choose to play with just one hand or both. I managed to work my way through Fur Elise by first playing each hand separately then eventually adding them together. Very affordable compared to traditional piano lessons. It’s very beneficial if you have multiple children at different levels because all seven levels are included! After a 30 second introduction in Lesson 1, the program required input from Izzie every 3-10 seconds. I absolutely love the fact Izzie is actively engaged from the beginning to the end of each lesson. Emily loved it. Believe me—until now, she’s never begged, “Please, may I just practice for 10 more minutes!” She’s putting in a lot more time with piano practice now. A lot. When compared to the cost of music lessons, this is a great value! Gess was tickled when she discovered that the computer could play notes on her keyboard and that it could also recognize what she played. It is pretty cool! I like that they are learning to read notes, and even playing portions of simple songs right from the beginning, practically. I also like the history portion, biographies of the composers, and even a timeline. I am very thankful, though, that we will have many more months to use it. I think I will need to be adding it to our budget, though, so we can continue using it over the next several years. As someone who has taken lessons from three different individuals in my lifetime (including one professor at college) along with self-teaching some aspects of playing piano when it comes to accompaniment, I have to say that I am really impressed with the MusIQ HomeSchool program from Adventus. Following the lessons will give the student time for theory (which P has fought me on in the past) as well as practice time, history and even some ‘fun’ time (which R loves to do.) The lesson plans do not assume that the home educator has any background in the material and yet makes it simple enough to implement. J has such a short attention span for the activities, as he is only 3 and not near the recommended 4th birthday, that we have taken a while longer per lesson for him. However, he is getting the basic concepts taught (high and low notes which they call birds and whales.) D has occasionally volunteered to help J with the lessons which warmed my heart to see the older child wanting to teach the younger. First off I will say that this is a multi-level, well rounded, self-sufficient, extensive music program. If you have been in the market for music lessons and have not been able to afford a piano teacher, search no more and investigate Adventus. The interface is very well thought out. When you play the songs the notes turned green or are crossed red if you make a mistake and you can’t move on until you fixed it. I think this is a great set of programs. Piano lessons are tremendously expensive, and yet research shows repeatedly that knowing how to read and play music is extremely beneficial to kids. On its face, the MusIQ suite of programs seems expensive, but when compared to the cost of piano lessons, especially if one has multiple children, it’s really a great deal! It’s also a lot of fun. Very quickly, my twins started learning about sharps, flats, quarter notes, and intervals. They were hooked because they were playing music! I think I was a little more entranced with their famous instructors (I loved Beethoven! ), but they didn’t think the concept was strange, and they didn’t resist practicing with Miss Melody. What kid doesn’t resist practicing the piano? My twins are using CMJ 2-3 times per week for about 1/2 an hour at a time, and they will continue to do so. They are really enjoying it. We loved the additional study on composers and music. The games really do help to reinforce the lesson. To be given the gift of being able to play an instrument is something the child will cherish for their whole life. I know personally I am very thankful for the sacrifices my parents made so we were able to have music lessons. Adventus MusIQ Homeschool not only enables the child to play the keyboard ( which is a wonderful base instrument to start music instruction upon so they can learn how to properly read music before branching into other musical instruments if the child wishes), but it also gives them the gift of music appreciation & the knowledge of music history which really does provide an insight into the history of the world. I am so excited that they have this chance to learn music and that I have this option of being able to pass on my love of music with an affordable & quality program that we can use right here at home & each child can complete at their own pace! It quickly became addictive to them… they beg for piano practice! We have taken years of traditional piano practice – and I’ve never had a child so enthralled as to beg to practice! This is not only fun – but, quickly moves into more challenging music instruction. “Tell them this is AWESOME”, said one of the Testers. Normally, I have to promise, beg, and threaten to get an hour of piano practice from these testers. Not with Children’s Music Journey – they were promising, begging and threatening me for more time! I’m quite impressed with all that is taught in the Children’s Music Journey program, and I’m also pleased with the way it is presented to the children in an age-appropriate manner. I’ve heard it said that the educated person knows Math, Music and Latin. Which leaves me wondering if we’ll ever get there. Thankfully, Adventus to the rescue for at least 1/3 of the equation! 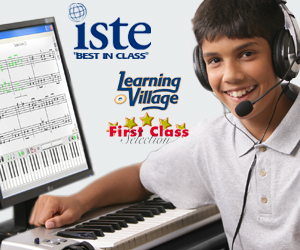 Quality music education, at your fingertips, for an affordable price. And yes, I LOVE this curriculum. She is having a blast learning how to play the keyboard. I can’t wait to see how this program progresses and where she’ll be by summer. There is nothing negative that I can say about this product. As a parent with no musical talent or education I loved how simple MusIQ was to implement in our home. For me part of the success of this program was that he was willing to provide this “public” performance because he is not my most outgoing child. I’m pleased and impressed by how thorough this piano software is. I like the interactive portion. And the set up for furthering skills in the practice and game rooms. It was fun! One of the joys I savor as a parent is watching my children have fun – yes – thoroughly enjoying their “formal schooling” time. The children would literally beg me to let them do their practice sessions and game times, even listen to the lesson and musical pieces (more than twice!) and improvise. Take note, this is classical music we listened to. It’s complete. I did say it was a complete musical curriculum. It covers theory, practice, allows improvisation, provides plenty of opportunities to listen to classical pieces, and uses games to reinforce music theory. The biggest benefit from this program for Alaina is her timing. She has to hit the note exactly when she is suppose to & hold it down for its full count or the note will be highlighted & she will be told to be careful. This was frustrating to her at first, but it has improved the timing of her playing. I think this program is wonderful & I really wish we would have had it six years ago when Amber started taking lessons. I feel this is a very well rounded program & could have saved us a lot of money on lessons for 3 girls over the years. The main thing that I loved about MusIQ Homeschool was the instant feedback that is afforded by this program. It can tell if your child is playing the correct note and it can tell if your child is playing the correct rhythm. Now, with MusIQ, the program tells her that she needs to try again and that things weren’t quite right and she doesn’t try to argue with it and she actually continues to practice until she has it right. Amazing! The confidence she is building from the fun lessons taught by some our most famous composers. Her favorite has to be the lessons taught by Bach. She has always enjoyed classical music. It’s exciting to her that she is able to play the piano now. Of course she has a lot more to learn. But after only a month, she is doing very well. She has learned to play from ear as well. As I have mentioned here before, she has some learning disabilities. So many “conventional” ways of teaching her do not work. She was the one who has really taken off with using this program. She loves the ALL aspects of learning how to play the piano. Adventus has made it very fun to learn. I really like the way this walks them through learning notes, the staff, melody, timing and other parts of music. I have not had to beg them to practice. They both enjoy exploring the program. This is an excellent program, and if you have a budding musician in your life and are on a limited budget, this is an excellent option for you. one of the huge advantages of a digital piano is that the student can practice at all hours and for as long as they like without disturbing the rest of the house. We were very pleased to find that MusIQ provided Noah with a comprehensive music theory course. He could receive feedback and detailed evaluations of his progress, and so could work independently, as Mr. Raber and I have very little music training. We particularly liked the wait and play feature where it would let you play a note and visually let you know if you got it right or not. We loved that it didn’t lock you into listening to the whole lesson before being able to move on to the next thing, or to go back to another lesson. You can also pick and choose the topics in any order from the list of lessons. I loved that he was already learning about the composers (who were the main characters) and different types of music theory within the first few lessons. When your kids put their hands on this, they aren’t going to want to do any other school work. They will be begging for MusIQ Homeschool first thing in the morning. I can understand why, it’s definitely a program you can get lost in. The girls both LOVED this program and actually ask all the time to play the piano, even on Saturdays!! I have LOVED this program for quite a few reasons, not only did it have music instruction for my younger kids, but it also has an older level for my older kids to! It intertwines music history, learning music notes, and makes kids excited to learn how to play the piano and learn about music history. we have already fallen in love with the program! She’s soaking it up like a sponge and is so excited about music now! Another fun component is that you are able to compose your own music with dozens of different instruments. We are using this program with all of our kids. I am absolutely thrilled with it! I feel that we both learned so much more than just merely how to play the piano. We learned music and piano history. We learned how to read notes. We learned proper piano posture and more. He shared that he liked the intro music as he started a new selection of each lesson a different selection was played by the featured composer. My son spent a lot of time in the music room which allowed more freedom with composing than he had before. He enjoyed playing his recordings for us. In terms of affordability and flexibility, MusIQ wins, no question about it. For families for which expensive weekly piano lessons with a live teacher are impossibly expensive or impractical, MusIQ is an excellent alternative.